The Gemini LMA101 features eight embedded super-magnets for easy and robust installation on metal surfaces. This 2*2 LTE 4G MIMO is a robust external antenna that is fully IP67 waterproof for use with all 4G/3G/2G MIMO cellular routers and access points worldwide. It includes two embedded high efficiency LTE MIMO antennas. 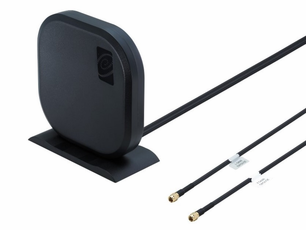 The antenna elements operate at all common and 4G LTE bands worldwide; 698-960MHz, 1710-2170MHz, 2490-2690MHz, which also include the 3G and 2G bands, meaning the antenna can also be used as fallback on 2G or 3G applications. High isolation and low ECC between the two embedded MIMO antennas prevents self-interference. Low loss cables are used to keep efficiency high over long cable lengths up to 5 meters.